Our singing lessons cover a diverse range of styles so, whether you love pop, musical theatre, classical, jazz or country, this is the place to take your singing to the next level. You can take private lessons, or join the Performance Academy which puts on a big show twice/three times a year. We also have a monthly open mic night which is a great chance for singers of all abilities to perform in an informal setting. We’d love for you to come and join us for a trial lesson with one of our vocal coaches. All our coaches are fully qualified, insured and dbs checked. Please list the day you wish to book so we can let you know what times are available. Or give us a quick call on 07957 425194 so we can align our diary with yours. Give the gift of Singing? Vocal Lesson and Recording Vouchers are available as gifts to friends and family! We also offer to take our students through their vocal exams in Rock and Pop with Trinity exam board. 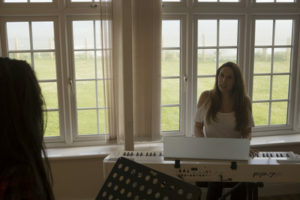 One of the wonderful things Barton Court Studios provides is the opportunity to perform. Make sure you’re all booked to perform at our next Open Mic Event. Have you asked about our Performance Academy? Every 6 months our team work towards our next show. This gives our students a chance to Sing/Dance/Act/ Work as a team and Perform. Take a look at some of the lovely things our students have to say about their lessons here!